After the freedom allowed in pre-school and kindergarten, school can get pretty tough. In addition to the homework and mounds of information being thrown at you, you also have to deal with social awkwardness for the next 12 years. Then there’s college…where you pay to experience it all over again. I’m not sure about you, but I’m not ashamed to admit that there was a lot of crying, tantrum throwing, and moments where I flat-out considered giving up. Working at a fast-food joint until retirement wouldn’t be that bad, right? However, with perseverance, support from my family, and a little comfort eating I was able to pull through, despite the difficulties. No doubt you also remember the more difficult times in your school years—especially when dealing with medical school or law school. However, now imagine if all of those difficulties were magnified by a factor of a thousand. This is what people with autism must face to get a basic level of education, let alone advanced degrees. However, despite the challenges, with proper support, guidance, and help from those who care, people with special needs can triumph over education (even without the comfort eating). A prime example is the overwhelming success of Erik Weber. Diagnosed with autism as a toddler, Erik Weber has by far exceeded medical expectations. Buoyed by the continuous love and support from his family as well as personal courage, Erik recently graduated from California Western Law School and passed the bar on his first try. After taking his professional conduct oath, he decided to help others with special needs reach their educational goals, by dedicating his life to practicing special education law. It just goes to show what anyone can do when they are dedicated, supported, and focused. Erik’s parents never gave up on him, even though he was unable to talk and was diagnosed with a perceived permanent cognitive level of an 18-month-old. They refused to just accept that their child would be unable to learn. Instead, they grieved the loss of their notion of “a perfect child,” and continuously worked with Erik to hone his communication skills. At the age of seven, Erik began to speak. The next hurdle to overcome was his social anxiety. Unfortunately, by this time Erik’s father had passed away, but his mother, Sandy, continued working to help Erik become more comfortable around people and crowds. Again, through his mother’s love and encouragement, he slowly began to adjust. This allowed him to participate in more activities and educational events; he has won over 106 medals for running in Special Olympic events. When it came to college, Erik decided that he wanted to be a lawyer. With the help of his mother, he enrolled in California Western School of Law. Although the first year was difficult, and he required the comfort of his mother’s presence in some classes—as well as her ability to drive him to campus—he flourished academically. Throughout his studies, his mother continued to encourage him to keep up with his physical exercises to help his focus and breathing, which allowed him to control his thought processes and studies. By the end of his college career, Erik had gained the confidence and knowledge he needed to pass the California bar exam on his first try. 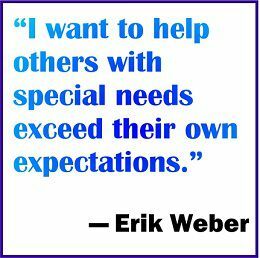 In light of his past and present, after taking his oath in front of a panel of judges, Erik Weber announced that he will be dedicating his legal career to helping other people with autism get the education they deserve by practicing special education law. After reading this amazing story of overcoming odds, how will you exceed your expectations? What can you do to help your clients get the help and support they need? Think about it.